"Annual service performed at scheduled time"
Meet Matt, your Foreman! Before joing our Production Team, Matt was one of our Service Technicians. He understands the importance of providing a thorough inspection to make sure everything is running smoothly and properly. 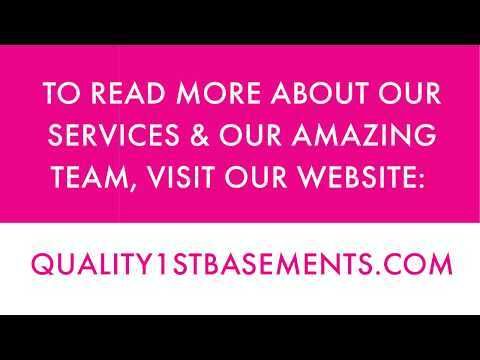 Matt is highly knowledgeable in basement waterproofing and is an expert on every service and product Quality 1st Basements provides. With the service experience and training he has, we knew he would be very valuable to our Production Department. "What I enjoy the most about my job is knowing that I am making a difference everyday in helping and ensuring our system is running properly in our customers homes to prevent flooding." In his spare time, Matt enjoys spending time with his family and his bulldog, Mack. Not only does Matt enjoy playing softball but takes great pride in his daughters love for softball as well. He enjoys going to amusement parks and the beach. Having a sump pump in your basement is step one in protecting your home but if this sump pump isn't maintained, it could be at high risk to fail. Quality 1st Basements replaced this old, failing sump pump and replaced it with our TripleSafe Sump pump system to protect this home from floods. Our TripleSafe is the ultimate protection for the basement because of it's three built-in pumps capable of handling any flow type of water.